The key figure in the 1995 Gustafsen Lake standoff – which saw more gunfire than the 1990s Oka crisis – was a warrior who, in later life, liked nothing better than to grow squash, beans and corn in his organic garden. “It was a lot of hard work for an Elder to do, but he would get out there into the field every day,” said Kanahus Manuel of William Jones “Wolverine” Ignace, who travelled extensively with Wolverine after Gustafsen Lake to support Indigenous warriors around the world. “Everything he did was to set an example for the young people. He always said we could feed ourselves and that was what he was doing with his Nourish the Nation program,” she said. 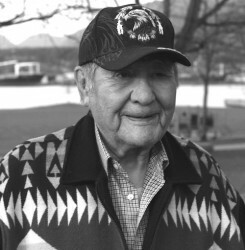 Wolverine was 65 when he joined 23 Sun Dancers in August 1995 on sacred Ts’Peten (pronounced Chuh-patten) the traditional Secwepemc name for Gustafsen Lake, unceded land near B.C.’s 100 Mile House. When rancher Lyle James demanded they leave his land, tension escalated into what would become Canada’s largest and most expensive domestic paramilitary operation. Four hundred police surrounded the area, aided by helicopters and armoured personnel carriers. Police shot at unarmed people and “RCMP Superintendent Murray Johnston said a resolution to the standoff would ‘require the killing of the defenders, including myself’,” wrote Wolverine in a letter to Prime Minister Justin Trudeau in December 2015. Wolverine was asking the PM for an inquiry into the extreme actions of police and heavy military force during the standoff. When the siege ended on Sept. 17, 1995, one person was injured but no one was killed. During it, Wolverine found himself dodging bullets and saving the life of fellow defender James “OJ” Pitawanakwat, who lives in political asylum in the United States after fleeing Canada from charges stemming from Gustafsen Lake. Convicted in 1997, Wolverine served about six years in prison for willful mischief, firing at police officers, assaulting police officers and possession of weapons and explosives. The trial was lengthy; questions were asked as to who signed off on the weaponry and military tactics used against the defenders, given the government’s responsibility to protect inherent rights and title of Indigenous people under the Constitution of Canada and Royal Proclamation of 1763. In his last year, as Wolverine battled cancer, his thoughts were of his people’s continued stand against the government and how he could help make a change. Though already very ill, he wrote his letter to Trudeau, thinking the Gustafsen Lake review might open up new dialogue. “If Trudeau is calling for renewed, nation-to-nation relationship and promising a new era of recognition, rights, respect and co-operation, then we need to know we can pursue peaceful processes for protecting our sovereignty, without the threat of state-sanctioned violence being used against them,” Wolverine wrote. An inquiry into the Ts’Peten standoff would demonstrate the Canadian government is truly committed to this new era of relationship, he added. Unfortunately, he went to his grave getting no response from Trudeau regarding his request. Justice Minister Jody Wilson-Raybould has said, and continues to say, that the federal government’s focus is on an inquiry into murdered and missing Indigenous women. In the years after Gustafsen Lake, Wolverine took up trapping, as well as organic gardening, which necessitated his travelling to all ends of traditional Secwepemc territory. Though he had become more sedentary in his eighties, Wolverine kept his bags packed and was always ready to go wherever he was needed. He travelled to Wounded Knee on Liberation Day, and north to stand with the Tahltan Nation which is blockading Imperial Metal’s Red Chris Mine in B.C.’s sacred headwaters. “Those are 20-hour drives and not the easiest thing for an Elder. But when he gets there, people just want to hear his stories and his strategies,” Manuel explained. In a 1997 interview conducted while in custody, Wolverine told Ben Mahoney of his early frustration in forcing the B.C. government, let alone the Supreme Court, to deal with the jurisdiction of unceded Indigenous lands. He described the shock on the faces of a United Nations panel in 1993 when he told them the “whole judicial system in Canada was so corrupt that the corruption begins in the very Law Society itself” and that the only way his people can reclaim what rightfully belongs to them is to approach the Queen and the Privy Council. It was for this kind of insight and experience that the Adams Lake resident was called north to lead the Gustafsen Lake occupation. After it, he gained a global platform, advising Indigenous people protecting land and culture in places like Chiapas, Mexico and Mapuche territory in Chile. Wolverine passed away on March 22, 2016 in Adams Lake. Hundreds of people attended his funeral.